Hello again, and welcome to the beginning of another season of semi-regular updates to this blog. I had aspirations to keep this place at least somewhat up to date over the summer but, alas, it was not to be. That's not to say I didn't have a pretty great summer vacation, which included a trip to Pittsburgh for the inaugural New American Music Union festival (more on that shortly) and the chance to finally see A Place to Bury Strangers live in Columbus (well worth the wait, I'll discuss that as well). However, the lack of a decent internet connection at my house this summer resulted in a decrease in ALL online activities, and this blog perhaps suffered the most. But now, with summer safely behind me, and after surviving a beginning-of-the-school-year-harddrive-crash, I find myself back at school with a little bit of free time on my hands. The first thing to talk about is the New American Music Union in Pittsburgh. The festival exceeded my expectations, and was extremely well attended, suggesting that it may stick around for at least one more year. 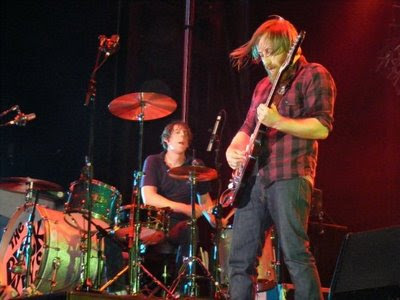 Friday night's highlights were a high energy set from Ohio's own Black Keys (although it's a shame they didn't play the same day as Gnarles Barkley and enlist Danger Mouse on organ) and a great show by The Roots, who I was pretty unfamiliar with, but have gained a new appreciation for as a result of seeing them live. Saturday was a much longer day of music (and standing around waiting for said music to start), all of which culminated in a performance from Bob Dylan. However, before the self promclaimed poet-lauriet of rock and roll took the stage, the crowd was treated to a string of great bands. First up was Gnarles Barkley, who packed pretty much every song you could ask to hear into their tight 45 minute set. It was just cool to see Danger Mouse in the flesh, playing the organ, xylophone, samplers, etc. on stage. Spoon played next, but with the expception of the songs on which they were aided by a horn section, I wasn't too impressed with their performance in comparison to my experiences with them in the past. Maybe it was just concert fatigue, but nothing really seemed to click for me, with the exception of a great rendition of "Underdog", a song that begs for the horns present on its studio version when played live. As the sun began to set, the Raconteurs took the stage, proceding to put on a show that was definitely on par with the energy the Black Keys had displayed the night before. The whole band was animated and looked like they were having a good time, especially when they were in the midst of playing highly modified renditions of their older material. Also, I'm now almost positive that Jack White and John Mayer had the same guitar-solo-facial-expressions coach. I won't spend much time talking about Dylan's performance, suffice to say that he pandered to the crowd a little bit with his choice to kick off the show with "Rainy Day Women #12 & 35" (imagine 10,000 people singing 'Everybody must get stoned') and "It Ain't Me Babe". But from there, Dylan pretty much meandered through the rest of his performance, as he often does these days; playing newer songs that aren't really what anyone came to hear. There were a few more glimmers of hope, namely "Tangled up in Blue" (although the impact of this song was reduced greatly by a sluggish tempo) and "Ballad of a Thin Man". And of course, there was the encore of "Like A Rolling Stone" which the audience attempted to sing along with, but quickly realized that they could not match Dylan's new syncopation of the lyrics. It wasn't the grand climax it should have been, but then again, no one really should have been expecting it be. For the price, it was definitely worth it, and with the reaction they got this year, I can easily see them doubling ticket prices and expanding the fest next year. 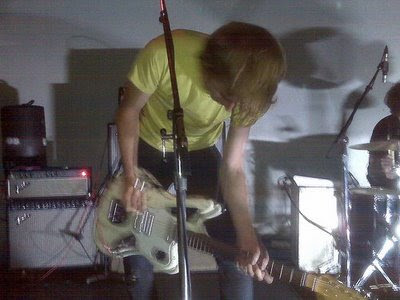 Now let's fast forward to a few weeks later; Skully's Music Diner, A Place to Bury Strangers has just taken the stage at about 1:00 in the morning after a string of some of the worst opening bands that Columbus has to offer (although that may just be my tired, impatient, grumpy side talking). The show was pretty much everything I imagined it would be, namely loud as hell. The band played a fairly short set, not more than an hour long, but they packed in just about every notable song off of their debut record, as well as a few b-sides from their bevy of 7" releases. Once the strobe lights kicked in towards the end, and the drone reached a peak, I think it was probably comparable to how people felt when they saw My Bloody Valentine back in the early '90s. At least that's what I'm telling myself, because I certainly can't afford to attend one of those reunion shows. It was a really good time, and I even snagged a copy of their new single. So, there's the catch-up. Stay tuned, update your bookmarks, there's more on the way.